I love fall—it’s undoubtedly my favorite season! 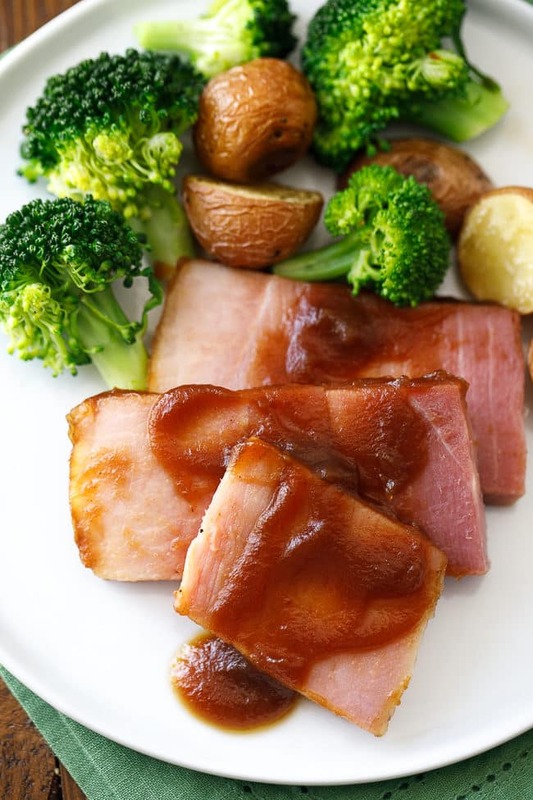 Whenever I start to feel that seasonal shift, I find myself craving warm, hearty family meals like this easy apple butter glazed ham recipe made with Sugardale Prestige Bone-In Ham Roast. This ham is so juicy and flavorful on its own, but my simple apple butter glaze just sends it over the top. 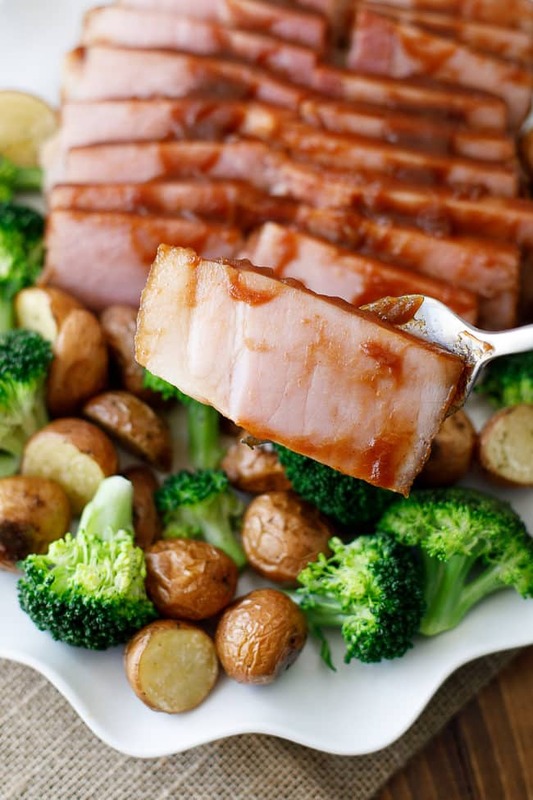 That scrumptious ham with delicious veggies looks like it belongs on your Sunday dinner table, right? 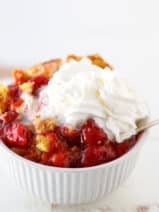 Well, this dish makes a great holiday or Sunday dinner, but it’s actually easy enough to whip up on regular weeknights too, thanks to the fact that the Sugardale ham roast comes fully cooked. You’ll just need to warm it in the oven and put together a very simple glaze to bring it all together. I served ours with steamed broccoli and roasted red potatoes, but you can use any side dishes you like to make this a complete family meal. I like this ham because it’s center-cut, meaning it comes from the best part of the ham. It’s almost all useable meat with little to no waste. It’s so nice when you can cook a really special family meal with very little preparation, and then have plenty of ham remaining for delicious leftovers throughout the week. Compared to a beef roast, this product from Sugardale is so incredibly affordable! My husband gets a lot of miles out of one of these ham roasts, as he loves having the leftover meat on a bun as a work lunch. Honestly, I used to reserve ham roasts for special occasions, like holidays or when I was hosting a large gathering. 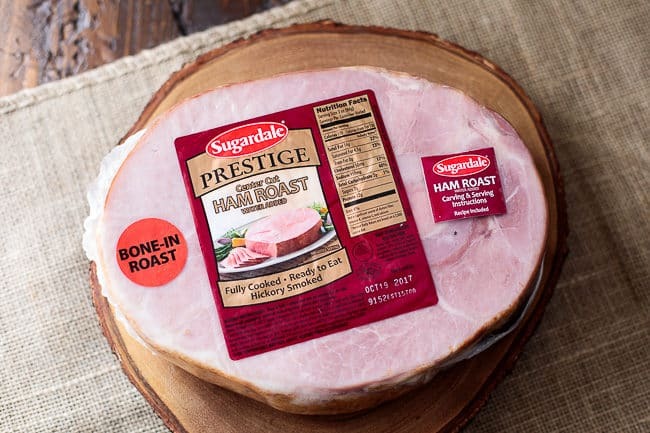 This ham roast from Sugardale is just the right size to make any night of the week, and trust me, it’s such a delicious, simple, and satisfying family dinner choice! Another great thing about this ham roast is how perfect it comes out every time. 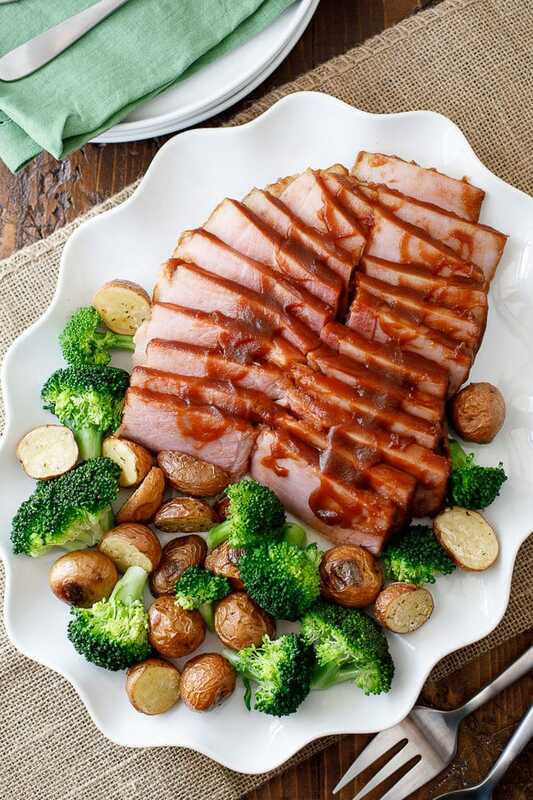 You certainly don’t need to create a glaze to enjoy a flavorful, moist and juicy ham. My kids love having this ham for dinner because the flavor and texture is so incredible. This ham was naturally smoked over real hickory wood chips! 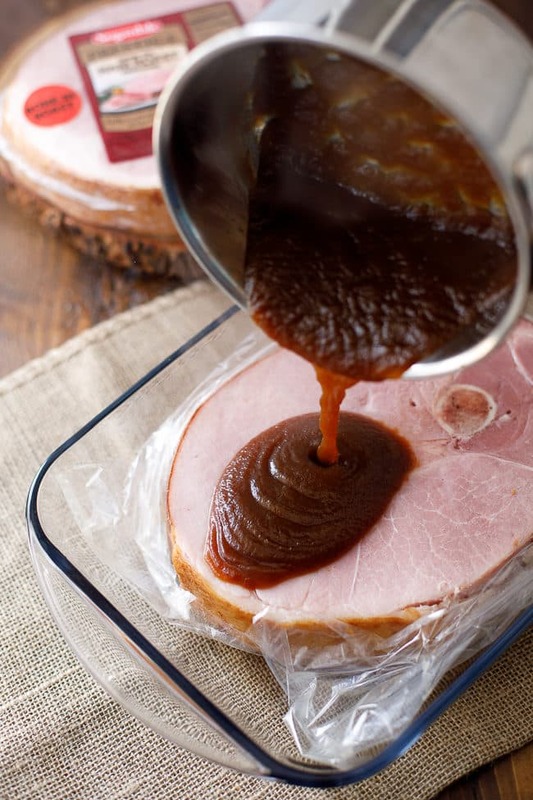 I hope you and your family love this yummy apple butter glazed ham recipe as much as we do! 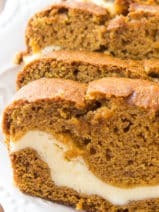 Connect with Sugardale Foods on Facebook, Twitter, and Pinterest. What’s your favorite fall family dinner? Let me know in the comment section for a chance to win your very own Bamboo Wood Cutting Board – perfect for slicing and serving ham! The winner will also receive a coupon for a free Sugardale Prestige Bone-In Ham Roast. This giveaway is open to us residents age 18 or older (or nineteen (19) years of age or older in Alabama and Nebraska). Winners will be selected via random draw, and will be notified by e-mail. The notification email will come directly from SheKnows via sweeps@sheknows.com. You will have 2 business days to respond; otherwise a new winner will be selected. Place ham roast in cooking bag and close. Place bagged ham roast in a shallow baking dish. Cut slits in the top of the bag to vent and warm the ham for 30-40 minutes in the preheated oven. While the ham roast is warming, add the apple butter, orange juice and Worcestershire sauce to a small saucepan. Heat until the sauce begins to boil, then reduce heat and stir continuously for 3-4 minutes. Remove ham from oven and cut open the top of the bag. Pull back the sides of the bag and pour the glaze over the ham. Bake ham for an additional 20 minutes. Remove ham to a cutting board and slice it for serving. Serve with steamed broccoli and roasted new potatoes, or the vegges of your choice! 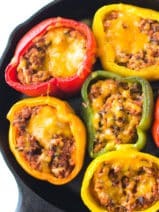 Chili recipe. It’s delicious! I could use it to grade the cheddar. Homemade beef stew is my favorite fall family recipe. My family’s favorite fall family dinner is Shepherds Pie. My favorite fall dinner is a nice pot roast with vegetables. I can cook it on Sunday and then have leftovers all week. Favorite fall family dinner is baked chicken with baked potato wedges. My favorite has to be a slow cooked pork and potatoes. Though your recipe looks to easily rival it. My favorite fall dinner is chili over rice. I love pork, sauerkraut and apples in the crock pot during the fall months. I love pork tenderloin in a sweet, savory rub with baked apples. We love Posole and I just learned how to make it! My favorite fall family dinner is chicken, squash and creamed peas. My favorite is a good hearty stew or curry or spicy sausage lentil soup for an everyday fall dinner. Our favorite thing to eat in the Fall is a bowl of chili! For fall I love home made pot pie casserole with home made crust. Our favorite fall dinner is ham and scalloped potatoes. We enjoy venison stew with lots of fall veggies. My favorite fall dinners are chicken soup, beef or chicken stew or chili. Chicken and cajun smoked sausage gumbo is our favorite fall dinner, with a fresh garden salad. My favorite is roast with pototoes and carrots. My favorite fall family dinner is homemade mac and cheese, biscuits and steamed broccoli! We like apple crisp for dessert. My favorite fall dinner includes my fave homemade vegetable beef soup and toasted swiss ham rolls with vidalia onion dressing! We love French Onion Soup, it is the best fall dinner! I don’t have a fall family meal, just cooking up the faves. Our favorite fall family dinner is white chicken chili with homemade biscuits on the side! Yum! My favorite fall dinner is pasta with pumpkin sauce. Our fave is a late-fall dish, butternut squash and sage lasagna, with kale and Brussels Sprouts salad and garlic bread…mmm! We love making beef stew. This looks delicious! I must give it a whirl. @winkytinky on Twitter. I love fall food..soups, stews are always popular. But my very favorite..mine and everyone’s is our traditional southern Thanksgiving. A huge spread..featuring a roasted bird and a pork loin. The best part is the sides..especially the carbs..like our over 100 year old recipe for southen sage cornbread dressing..to DIE for. Favorite fall dinner is chili. We are trying to eat better, so raosted eggplant! Our favorite fall family meal is turkey, mashed potatoes and green beans! My favorite fall dinner is a pork roast that has cooked in the slow cooker all day with potatoes and carrots! There’s nothing better than coming home from work to the house smelling all yummy! My favorite fall meal is either pot roast or beef stew; but this ham sure looks yummy! 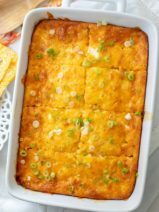 We love Buffalo chicken casserole. Our favorite fall dinner: baked pork tenderloin smothered in homemade applesauce and a side of yams sprinkled in pumpkin pie seasonings! Wow, your presentation of this meal is so appealing! My culinary skills may not be as accomplished as yours but with this recipe I can at least get the taste up to par! Thank you for sharing it. Favorite fall meal is any homemade soup,, especially chicken noodle. I absolutely love beef stew in the fall. It is such a hearty, warm and filling meal. 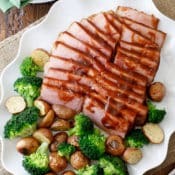 My favorite fall recipe is honey glazed ham! Our favorite family dinner is baked chicken with potatoes, onions and green peppers that I’ve been making for years. I like to make homemade Chile for my family in the fall. We love roasting a leg of Lamb with the usual suspects…brussel sprouts, loaded smashed potatoes…. Our favorite family fall recipe is a vegetarian chili made in the crockpot. 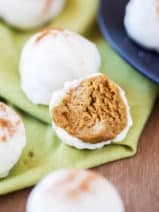 Easy, yummy, and filling! what a great cutting board!! That meal would be a hit with everyone in my family. My daughter recently discovered she loves ham, my husband loves broccoli, and I love roasted potatoes. And that apple butter sounds delicious. Pinning for sure! Our favorite fall family dinner is chicken tortilla soup! Mt favorite Fall dinner is my daughter’s fabulous pot roast. She is the BEST cook!! This sounds great.. out fall favorite is beef stew (which we ate having today). My favorite fall dinner consist of good ol’ South Louisiana Gumbo and potato salad! C’est Bon! Butternut squash soup with apples is our favorite fall dinner. My favorite fall dinner is a roast with potatoes and baby carrots. That recipe looks awesome! Thanks for sharing it. I’ve used peach butter on a ham, but never apple butter. My daughter just brought me a jar of apple butter from a local orchard she went to last weekend. I’ll definitely have to give this a try. 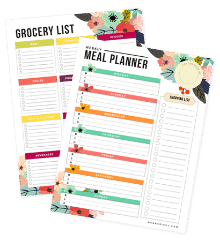 (Oh, and I would love a new cutting board – lately I’ve just been cutting on a plate, which is not easy, since my old cutting board finally split and I had to throw it away). My favorite fall family dinner is roast chicken with baked sweet potato and a green vegetable. I love having chili in the Fall! Turkey and mashed potatoes are our favorite. This looks delicious! My favorite fall dinner is Salisbury steak with mashed potatoes, gravy, green beans and rolls. We love beef stew during the cool fall evenings. We love ham too though. One of my favorite fall dishes is a roasted turkey breast with some roasted cauliflower & sweet potatoes. We love hearty beef stew served in a large hollowed out baked potato. Oh, yum!! We enjoy a nice beef roast in the slow cooker. My favorite fall family dinner is braised short ribs! My slow cooker does it all. convenience and comforting. Whiskey glazed ham, mashed potatoes, gravy, stuffing, green bean casserole and pumpkin cake roll. My fondest memory of my youth was during the winter time, waking up to the smell of breakfast. Eggs, Biscuits, Red Eye gravy, and slices of Honey Mustard Ham with Pineapple. I can hardly wait to try your recipe of Apple Butter Glazed Ham with the eggs, biscuits, and gravy. This recipe looks delicious. I think our family favorite meal has got to be a Turkey dinner with all the trimmings! We have two favorites – a big pot of chili beans or a big pot of oyster stew. The family always comes running for these two. Our favorite go-to fall meal it my husbands chili: ground beef, spaghetti sauce, diced and whole tomatoes, chili hot kidney beans, tomato sauce, Italian seasoning, and spaghetti. My favorite fall dinner is a slow cooked pot roast with potatoes, onions, mushrooms, and carrots. This looks incredible! My favorite fall recipe is a chicken skillet with sweet potastes , Brussels sprouts, apples and bacon! Our favorite fall family dinner is chicken and sausage gumbo.